Labor Day was always kind of a non-event in our family. I mean, it was a day off work and/or school, but I don't ever remember really celebrating it in picnic/barbecue fashion. Once I was college age, Labor Day was just a day spent going through registration, purchasing books, and settling into a too-small dorm room with two or three strangers. Last year, we had a really enjoyable Labor Day picnic with some of our dearest friends (hi Jay and Andrea!!!) at their lakeside campground, eating ribs and holy-cow-these-are-hot jalapeno poppers, and roasting s'mores. To date, it was the best Labor Day on record. But something tells me that this year will cruise into the winners' circle with the in-the-flesh arrival of this little itty bitty, on or around September 5th. It is with great pleasure and no small amount of relief that Jim and Ifinally introduce you to our 5th child, currently about 10 weeks gestation. S/he has a beautiful heartbeat of 185 beats per minute, and looks "perfect," according to the ultrasound technician. I will post more about this pregnancy -- how I found out, how I told Jim, how I'm been feeling. But for now, merely rejoice with us over our newest blessing. Oh wow! I am so excited and thrilled for you and Jim! What an absolute blessing! Please know that I will add your pregnancy to my prayer list and will be praying for you and your baby to be healthy and strong. Eeeeeek! That's just how excited I am! And I love seeing the ultrasound pics - they always amaze me. Rejoicing with you sweet friend...oh how I am rejoicing!!! Rejoicing, rejoicing, rejoicing. So thankful for you, your family and this new little one already growing in your tummy! Mike and I are so excited for you. Maybe our children can be BFF's!!! That is WONDERFUL! I am so excited for you! I will pray for you too! What a blessing! Congrats, Monica. That is wonderful! Yay, yay, yay! So happy and rejoicing with you! Very cute and creative way of making the announcement. :) Big hugs, D.
So great to meet you tonight! AND, my sister and I were BOTH born on Labor Day! My birthday is the 3rd and hers is the 5th. It's a wonderful birthday- always with the day off of school! I'm thrilled for you! *BIG HUGS* YAY! My only complaint is that it is going to be very hard to bring you dinner the week you come home this time. ;) Praying for a healthy, wonderful, blessed pregnancy! I'm so happy for you & Jim! Mon, I'm so happy for you guys. I know that you are thrilled. You are, and will continue to be, in my prayers. I love you and am so excited to see what God is going to do in and through you. Love you, girl! Once again - congratulations! Sending prayers to you and your family. Congratulations again! 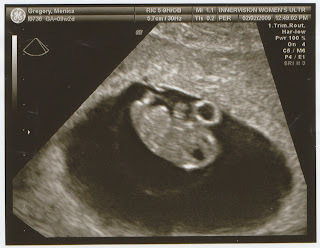 I'm excited for you guys; your little "bean" looks perfect! Can't wait to hear more about your pregnancy! Yeah! Congrats! Hope it goes smoothly will be praying! Yay! Congrats. Hope the best for you! Looks to be a beautiful baby. Rejoicing with you... for the little one being knit together within you. What a blessing!!! Monica~congratulations! I hope everything goes well with your pregnancy. I appreciated all your insights on your Blissdom trip~congrats on owning your own domain! !